As time passes by, let their memories always be in your heart with this beautiful Memorial Heart Keepsake Clock. This memorial clock creates a touch sympathy gift to remember those who have passed on and becomes a timeless keepsake that lets their lives live on forever. This Memorial Heart Keepsake measures 5” x 5” with edges measuring 1” thick. Each Keepsake features a silver edged timepiece with quartz movement. Free personalization of any name and dates are included. 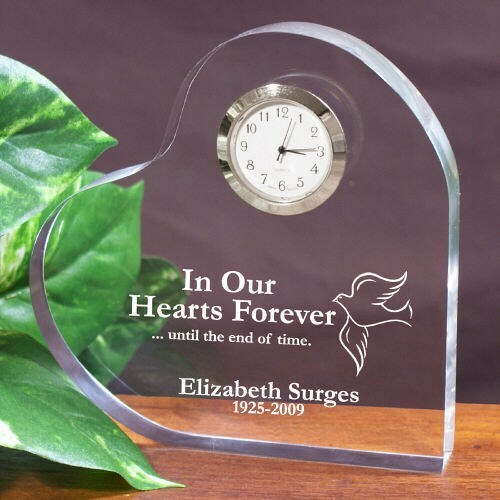 Additional Info Create beautiful reminders of loved ones that have passed with our Personalized Memorial Gifts. Our collection of Memorial Keepsakes help make your loved ones live on forever and make meaningful comfort gift ideas.